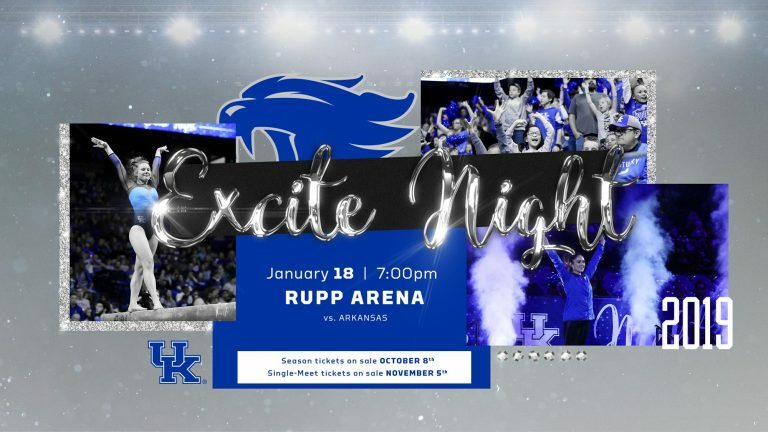 The Kentucky gymnastics team will kick off its 2019 home campaign when it hosts its annual “Excite Night” at Rupp Arena for the second consecutive season at 7 p.m. ET on Jan. 18, 2019 in a matchup with Arkansas. UK posted its highest opening-meet score in program history and took down Ball State, George Washington and Southeast Missouri State in front of a sold-out crowd in the storied venue last season. The Wildcats took home a title in every individual event. Sidney Dukes ended Excite Night with the highest score of the meet, a 9.9, in front of 10,006 fans. UK took the top three spots on the floor, as Alex Hyland scored 9.875 and Mollie Korth scored a 9.850. Fans looking to purchase or renew season tickets can do so beginning Oct. 8 through My UK Account. Reserved 2019 season tickets prices have been placed at $30 and general admission will be $20. Ticket prices are inclusive of Kentucky state sales tax. Fans may purchase new season tickets online at UKAthletics.com/tickets. Season tickets offer considerable savings over the cost of buying single-meet tickets. Season ticket prices include admission to all four home meets in Memorial Coliseum as well as Excite Night in Rupp Arena. Single-meet tickets will go on sale Nov. 12 at 9 a.m. ET, exclusively through Ticketmaster.com. UK Athletics is excited to adopt “Digital Delivery” for all Kentucky gymnastics general admission season tickets, beginning with the 2019 season. Instead of receiving printed tickets, general admission season ticket holders will be able to access their tickets electronically through My UK Account or the UK Athletics app. Fans with reserved season tickets will still have the option to receive printed ticket books or have tickets placed at will call, in addition to the new digital delivery option. For more information about digital delivery, visit UKathletics.com/DigitalDelivery.